Save the Date for Iowa Pediatric Mental Health Collaboratives Spring 2019 Conferences! The Iowa Pediatric Mental Health Collaborative invites you to the upcoming conference, Critical Conversations: Pediatric Mental Health in Primary Care to be held on Wednesday, April 24th, 2019, from 8:45am-2:45pm, at the Bridge View Center in Ottumwa, Iowa. The purpose of this conference is to help primary care providers increase their capacity to treat children and youth with mild to moderate mental health needs within their medical home. 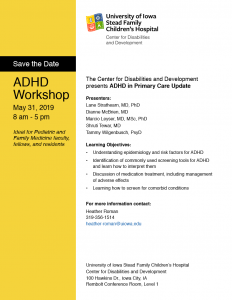 Conference sessions will include information about identifying, assessing and treating common child and adolescent psychiatric disorders such as ADHD, Anxiety and Depression. Conference attendees will have the opportunity to network with peers, child and adolescent psychiatry providers and other mental health providers from both the University of Iowa and your community. Participants will also learn about the new Iowa Pediatric Mental Health Collaborative. This conference is sponsored by the University of Iowa Division of Child and Community Health and Child Health Specialty Clinics. For more information on the conference or how to register, contact Kafi Dixon by phone or email at 319-356-3570 or kafi-dixon@uiowa.edu<mailto:kafi-dixon@uiowa.edu>. Webinar: Deportation - What Comes Next? To obtain CME and MOC part 2 credits you will need to complete this assessment. Children's Hospital & Medical Center is partnering with UNMC’s otolaryngology department to host the third annual Midwest Pediatric Specialty Symposium. The all-day course is scheduled for Friday, March 22, 2019 at UNO’s Thompson Alumni Center (Omaha, NE) and the curriculum will cover common eye & ENT concerns in the pediatric population. CME + CNE credit applications will be submitted. Full agenda available late 2018. On October 31, Governor Kim Reynolds, announced the launch of 5210 – Healthy Choices Count. In support of this initiative IMS has added the on-demand webinar Prevention, Assessment, and Treatment of Childhood Obesity in Iowa on the Childhood Obesity portion of the website. Explore the impact of weight bias on patient experience and how to minimize the impact. Discuss the staged approach to prevention, assessment, and treatment of obesity in children and identify tools to assist in its implementation. Explain the benefits of using motivational interviewing and brief action planning during clinic visits. Explore the importance of multi-setting approach to prevention of obesity and identify ways healthcare providers can advocate for and support this in their community. This is a free webinar, however, participants do need to register. Once the registration is processed, a separate email with the link to the recorded webinar will be sent to the email associated with your IMS account. The National AAP has announced that Pediatrics in Review (PIR) is approved for Maintenance of Certification (MOC) part 2, starting in January 2017, offering 20 MOC points. The journal is approved to offer 30 Part 2 Maintenance of Certification (MOC) points beginning in 2017. Included in each monthly issue of the journal will be three quizzes eligible for MOC points. Subscribers must complete the first 10 issues or a total of 30 quizzes of journal CME credits and achieve a 60% passing score to claim MOC credits as early as October 2017. Join your colleagues in learning more about pediatric growth & endocrinology by enrolling in an innovative telementoring model of health care education. This model, Extension for Community Healthcare Outcomes (ECHO), is an evidence-based model to expand primary care capacity to deliver state-of-the-art care for common, chronic diseases in vulnerable, underserved communities. The Georgia AAP Chapter, in collaboration with Navicent Health Children's Hospital, uses case-based learning sessions delivered via videoconferencing technology to bring together subspecialists at academic medical centers and community-based providers. Each Pediatric Growth and Endocrinology ECHO clinic includes a brief presentation by a pediatric endocrinologist, followed by case-based presentations by community clinicians for feedback and recommendations. Participation in this telehealth program is free and CME is available. For more information or to join, contact Kylia Crane at (404) 881-5093 or kcrane@gaaap.org. What are the nation’s experts saying to their patients about HPV vaccination? Three providers—a pediatrician, an OB-GYN, and a head and neck surgeon—outline the importance of vaccinating 11- and 12-year-olds against HPV cancers in a newly released e-learning module. RNs/NPs, physicians, physician’s assistants, and pharmacists can earn a free hour/credit by viewing the CME module here<http://bit.ly/cmeNEWSLETTER>. Non-credit seeking audiences can view the video here<http://bit.ly/ytNEWSLETTER>. As of August 17, 2011, two hours of continuing medical education (CME) for end-of-life care and two hours of CME for pain management have been required for all primary care physicians, including pediatricians. This CME must be obtained every five years, similar to the child abuse CME requirement with which most people are familiar. As of August 17, 2016, you are required to attest that you have completed this CME within the past five years each time you renew your license. A partial list of CME activity that may be applicable to these requirements can be found on the Iowa Board of Medicine website, scroll down to training opportunities. While much of the information provided is applicable to adults, you are free to choose applicable pediatric CME. Some options are listed below. This online course is available via PediaLink, the AAP Online Learning Center. 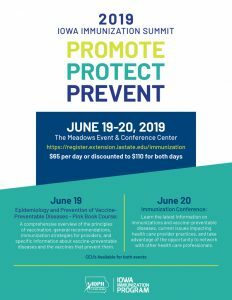 The main goals of this course are to increase the number of pediatricians who understand how to assess and treat pain, as well as how to identify patients at risk for misusing and abusing opioid medications. For more information and to take the course, visit the website. The course is available through September 2019. If you have questions, please contact the Iowa Board of Medicine at (515) 281-5171 or ibm@iowa.gov. For information on CMEs sponsored by organizations other than IA AAP, please visit the following websites. If you would like your CME to be included in our Events calendar, please contact us.